JSP setProperty-getProperty – The jsp: setProperty activity tag is utilized to set property estimations in a bean utilizing setter method. The setProperty uses java bean for the development of web application. The jsp: getProperty action tag is utilized to get property estimations in a bean utilizing getter strategy. This getProperty is used for web application with java bean. Following is the best example to understand the JSP setProperty-getProperty. JSP setProperty-getProperty – Here created two text fields username and password, written methods getUsername() and getPassword() to retrieve the user name and password. For the data members the developer used private keyword means that encapsulation concept. Here included userdetails.jsp file in form method. Output will be as follows with two text fields one for username and another for password and register button also. After entering the username and password output will be as follows. 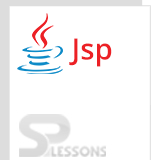 JSP setProperty-getProperty used to build dynamic application with java bean. jsp:setProperty activity label sets a property estimation or qualities in a bean utilizing the setter strategy.